Anyway, one day last week the boys and I had to stay in all morning to wait for a man to come and look at our fireplace, so to combat the boredom I thought we should do some baking. As well as making a couple of purées for Alexander, while the littlest one slept Elliot and I made the banana and chocolate muffins. These fit in well with my current attempts to reduce the amount of sugar in Elliot’s diet and increase the number of fruits he’ll eat. Currently bananas on their own are on the “NO” list, which is bizarre as he used to hoover them up a year or so ago! Kids eh? We substituted rapeseed oil for the macadamia oil, and runny honey for the agave syrup. 1/2 cup oil – macadamia is suggested but we didn’t have any in, so used rapeseed. I guess olive would have been fine too. Heat your oven to 180 degrees centigrade. Put muffin cases into a 12 hole muffin tin. Mash bananas and mix in all wet ingredients, whisk until well combined. Sift in all dry ingredients, mix well. The recipe I followed suggested using the 1/4 cup measure to spoon the mix into the cases, and I have to say what a genius idea! Even with a three year old “helping” me, that made it really easy. One cupful in each case! 15-20 mins in the oven and you’ve got some lovely muffins. I think I’ll look out for some macadamia nut oil and agave syrup as it would be great to taste the original recipe also. 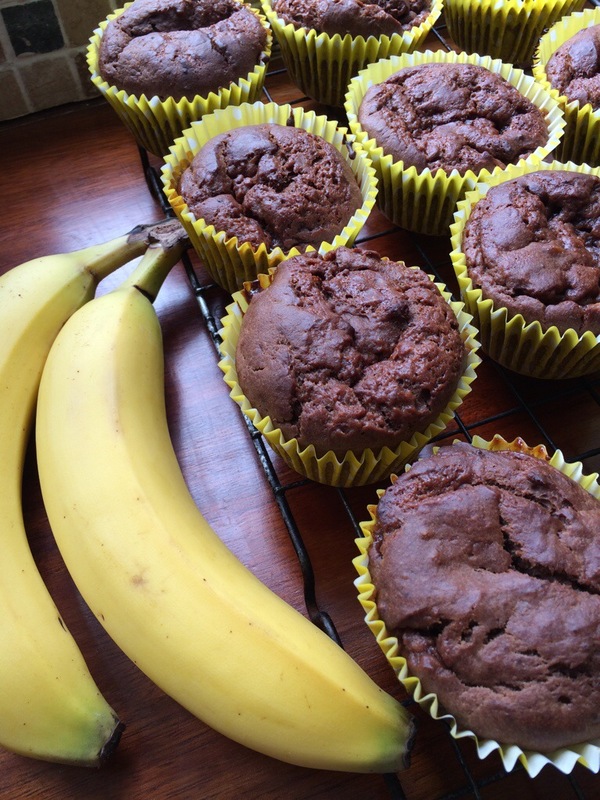 This entry was posted in Recipes and tagged baby led weaning, banana and chocolate muffin, sugar free, toddlers. Bookmark the permalink. They look and sound so tasty!! Ooo the goodness of banana with the yumminess of choccy! It’s a good mix! I like to think the banana cancels out the chocolate! Two of my favourite ingredients. I really must have a go at making these as they look delicious. Well Chocolate & Banana’s are my eldest’s favourite foods so will definitely be looking into making these. mmm – they sound yummy – like the idea of chocolate with the bananas as my two aren’t keen on bananas either these days. I always get scared off by recipes that ask for things like agave syrup – never thought to use a substitute – doh! Lo0king yummy, have been known to use cooking as a distraction/entertainment, in the vague hope that my tot may let something unfamiliar pass his lips! Ooh, these look fantastic I might have to give them a go!